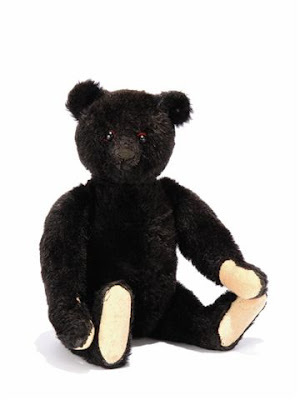 Here is a rather lovely black Steiff Teddy Bear, circa 1913. Sixteen inches of rare Teddy! One of the many amazing Steiff Teddy Bears and soft toys to be included in the sale. If you would like a copy of the full colour catalogue, email Christie's and place an order soon..
how old would he be? He looks lovely. wow wow wow.....this is such exciting news!!!!! This chap is from 1913, he is one of the famous Titanic bears, that were bought out after the ship went down..